Often the key success factor for a small to medium size (SMB) organization is an efficient, low cost IT operation that is aligned with the business strategy. Such IT systems can be complex and require experts to select, configure, customize, tune to operate effectively and maintain. The total solution can be very costly, especially if the business model requires customization and ongoing maintenance and upgrades. Without a carefully designed IT solution, implemented and maintained by highly skilled staff an SMB risks disaster and erosion of their profit margins. Inter and intra networking: The local and internet network design and implementation services. These services include an evaluation to determine requirements and creating strategies for security, access and ensuring performance. IT Infrastructure: Industry standard Windows and Linux based workstations and servers in robust configurations (RAID 0-6) interworking with required Network Attached Storage. 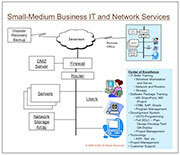 The vendor systems supported include HP, IBM, DELL, Oracle-Sun Microsystems, CISCO, NetApp, Brocade, EMC, and others. Databases: Database selection, configuration and customization services for Microsoft SQL, Oracle (excluding iRAC), and MySQL. Transition, Transformation and Custom Application Development: Design, develop, testing and deployment services. Full SDLC services are available for complex web as well as non-web based applications. In addition, G-ESI Center Of Excellence (COE) is specially suitable for complex transition and migration projects requiring off-site development and integration testing prior to deployment. Our team of experienced management consultants, business analysts, solution architects and technical consultants work with the client key stakeholders to review the business needs and requirements. The system and software application needs, goals, objectives and the operation’s performance requirements are outlined and agreed upon. The system solution is designed and any POC (Proof of Concept) is built. Any final fine-tuning of requirements and solution architecture is completed and agreed upon before launching the full solution development and implementation cycle. Our proven industry standards based best practice described below are an essential part of ensuring successful project implementations with lower risk of failures. Portfolio Management and Project Management Office (PMO): is used to ensure projects are managed by experts with tools and controls visible to our customer’s key stakeholders and management team. 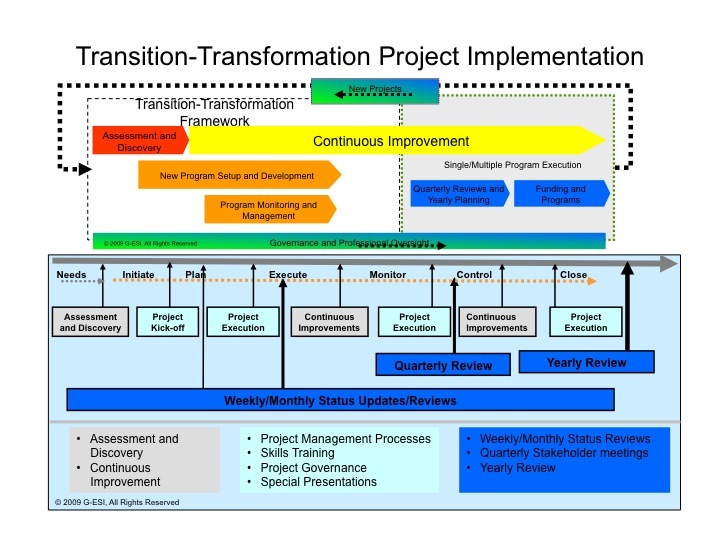 Center Of Excellence: Many transition and transformation projects require zero down-time of customer’s IT system. G-ESI has a unique model based on the COE infrastructure to ensure all the design, development and testing is accomplished prior to deployment to ensure highest quality and rapid delivery of IT projects. All solution designs, development and testing is done in a customer controlled environment prior to delivery,thus minimizing unnecessary surprises and lowering costs of development through deployment. Technology and skills training: All our IT staff are trained in our COE with hands-on training and accredited with industry credentials. Post-Sales support: All our solution delivery and implementation are offered with Gold (8 hours), Silver (12 hours) and Bronze (24 hours) service levels for Post-Sale Support. Our 24X7 call center and skilled staff are available to service toll free L1-L5 service calls as well on-line chats.